Aly Engstrom began working at the Wal-Mart Supercenter of Burleson in 1996. She became acutely aware of the many needs her co-workers had day-to-day and realized that their needs were just an extension of Burleson area needs. Her position with the local company allowed some flexibility and through research she determined that many community needs could be met, for companies, charities and individuals. This discovery has led Aly to be involved in many projects benefiting children, women, senior adults, entire families, and communities. 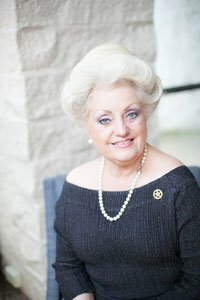 She has served as President of the Athena Society of Burleson. Many non-profits have benefited from Aly’s involvement and support. Those include Johnson County Child Advocacy Center; Cook’s Children Hospital, Ronald McDonald House, Scottish Rite Hospital, Wings of Hope Equine Center, Making It Happen for Kids, Project Celebration, FFA, Children’s Miracle Network, and Shriner’s Hospital for Children. She has helped provide funds through Wal-Mart to the Burleson Fire and Police Departments to obtain special equipment, American Cancer Society – Relay for Life, Huguley Hospice, Burleson Heritage Foundation, and Meals on Wheels of Johnson and Ellis County. She has also served on the Crystal Heart gala committee providing support through Wal Mart for Huguley Medical Center. Aly has received Volunteer of the Year from numerous organizations and other honors include: the Careity Foundation Volunteer of the Year. United Way Volunteer of the Year, Optimist Volunteer of the Year, The Ann Heberle Humanitarian Award, Fort Worth Scottish Rite Appreciation Award, and Scottish Hospital Appreciation Award. She was presented the 2005 Burleson Area Chamber of Commerce Citizen of the Year Award. She was applauded for her hard work and dedication to making Burleson a better place to live. Aly is currently serving her second 3-year term on the BACC Board of Directors. On a personal note, Aly and her husband, Chuck, share children and grandchildren who are very special to them. Aly likes to create, whether it is through a volunteer project, sewing or special embroidery work. She graduated from Cleburne High School and attended Tarrant County and Hill College earning a bachelor’s degree in art and her paralegal certification.